Several members of the Ly-49 receptor family inhibit NK cell-mediated lysis of targets expressing appropriate MHC class I molecules. Ly-49D and Ly-49H, two Ly-49 molecules that lack immunoreceptor tyrosine-based inhibitory motifs (ITIM) in their cytoplasmic domains, associate with mouse DAP12, a molecule that possesses an immunoreceptor tyrosine-based activation motif (ITAM). Cotransfection of either Ly-49D or Ly-49H with DAP12 induces surface expression of both Ly-49 and DAP12. The Ly-49/DAP12 complex was coimmunoprecipitated from the transfected cells, demonstrating a physical association of DAP12 with Ly-49D or Ly-49H in the plasma membrane. Stimulation of transfectants with Abs recognizing either Ly-49D or Ly-49H results in cellular activation, as assessed by induction of tyrosine phosphorylation of multiple cellular substrates. Natural killer cells express receptors for MHC class I, which upon recognition of appropriate polymorphic class I ligands deliver an inhibitory signal, resulting in the inhibition of target lysis. Mouse Ly-49A, the prototypic inhibitory receptor for H-2 (1), is a homodimeric type II integral membrane protein of the C-type lectin family expressed on NK cells and a small population of T cells. The Ly-49 family includes 9 genes, Ly-49A through I (2, 3, 4). Seven of the Ly-49 molecules (5) possess an immunoreceptor tyrosine-based inhibitory motif (ITIM)3 (V/IxYxxL/V) (6, 7) in their cytoplasmic domains. The phosphorylated ITIM in Ly-49A and Ly-49G2 bind the cytoplasmic tyrosine phosphatases SHP-1 and SHP-2 (8, 9, 10). Engagement of Ly-49A by its ligand H-2Dd interrupts early activation events induced by interaction of NK cells with target cells (9). Ly-49D and Ly-49H lack ITIM and possess a positively charged arginine residue within their transmembrane domains. Ly-49D is unable to deliver an inhibitory signal and in fact may activate NK cells (11). Human NK cells express a functionally analogous set of molecules, the killer cell inhibitory receptors (KIR), which belong to the Ig superfamily (7). KIR, like Ly-49, can be divided into two subfamilies based on the presence or absence of ITIM in their cytoplasmic domains. KIR2DL or KIR3DL possess ITIM and inhibit lysis of targets expressing their MHC class I ligands. KIR isoforms lacking ITIM (KIR2DS) possess a positively charged residue in their transmembrane domains and deliver an activating signal (12, 13). DAP12, which noncovalently associates with KIR2DS2 (14), possesses an ITAM in its cytoplasmic tail and a negatively charged aspartic acid residue in its transmembrane domain. Ligation of the KIR2DS2/DAP12 complex results in cellular activation. Here, we examine the association of mouse DAP12 with Ly-49D and Ly-49H and examine the ability of these complexes to activate downstream signaling pathways. cDNAs encoding Ly-49A (15), Ly-49D (2), and Ly-49H cDNA (3) were provided by W. Yokoyama (Washington University, St. Louis, MO) and F. Takei (Terry Fox Laboratory, Vancouver, British Columbia). The mouse DAP12 (14) sequence has been reported. Epitope-tagged chimeras were generated for Ly-49H (Ly-49H-myc) and DAP12 (DAP12-Flag). Open reading frames of the Ly-49 cDNAs were subcloned into the pMX-neo retroviral vector and mouse DAP12-Flag into the pMX-puro vector (16). Plasmid DNA was transfected into Φ-NX-E cells (a gift from G. Nolan, Stanford University, Stanford, CA) using lipofectamine (Life Technologies, Gaithersburg, MD). Viral supernatants were collected 2 days later and used to infect Ba/F3 (16). Two days postinfection cells were switched to selection medium, and Ba/F3 cells stably expressing Ly-49D/DAP12-Flag and Ly-49H-myc/DAP12-Flag were sorted for homogeneous high level expression of Ly-49. FITC-conjugated anti-Ly-49A (JR9–318 (17)), anti-Ly-49D (4E5, a gift from L. Mason and J. Ortaldo National Cancer Institute, Frederick, MD), anti-c-myc (9E10, provided by Mike Bishop, University of California, San Francisco, CA), and anti-Flag (M2, Kodak Rochester, NY) were used. Control Abs were rIgG2a, mIgG1, and mIgG1-FITC (Becton Dickinson, Mountain View, CA). Anti-Ly-49D was visualized with anti-rat IgG-FITC (CalTag). Anti-myc and anti-Flag were visualized with anti-mouse IgG-PE (CalTag, South San Francisco, CA). Immunofluorescence was performed as described (18). Transfected Ba/F3 cells were labeled with 125I and solubilized in digitonin lysis buffer as described (19). Cell lysates were incubated on ice for 2 h with Pansorbin (Calbiochem, La Jolla, CA) coated with rabbit anti-mouse/rat Ig (Sigma, St. Louis, MO) and anti- Flag mAb M2, anti-myc mAb 9E10, anti-Ly-49D mAb 4E5 or control IgG and then washed. Nonreduced or reduced immunoprecipitates were run on 18% Tris/glycine gels (Novex, San Diego, CA) and visualized using a PhosphorImager (Molecular Dynamics, Sunnyvale, CA). Transfected Ba/F3 cells were suspended in cold PBS-0.5% BSA at 5 × 107 cells/ml containing 20 μg/ml mAb recognizing Ly-49, Flag, or control IgG. Cells were stimulated and lysed in NP40 lysis buffer as described (14). For total tyrosine phosphorylation, lysates (2–3 × 106 cell equivalents) were analyzed on SDS-PAGE, and immunoblots were blocked, probed with 4G10-horseradish peroxidase (Upstate Biotechnology, Lake Placid, NY), washed, and visualized with a chemiluminescent substrate (Pierce, Rockford, IL). DAP12 and Syk were sequentially immunoprecipitated. Immunoprecipitates were analyzed by SDS-PAGE. Immunoblots were probed with anti-Flag-biotin (DAP12) or anti-Syk antiserum (kindly provided by Joe Bolen, DNAX, Palo Alto, CA), followed by either streptavidin-HRP or protein-A-HRP, and visualized as above. Transcripts of Ly-49D and Ly-49H are present in IL-2-activated NK cells (20). Ly-49D is expressed on ∼50% of NK cells (11) and is associated with a tyrosine phosphoprotein of 16 kDa (21). Murine NK cells, like human NK cells, transcribe mRNA for DAP12 (data not shown), a molecule that associates with the activating KIR2DS and mediates cellular activation (14). To examine if Ly-49D or Ly-49H associate with DAP12, we stably transfected Ba/F3 cells with an epitope-tagged mouse DAP12 (DAP12-Flag). Ba/F3-DAP12-Flag cells do not express DAP12 on the cell surface (Fig. 1⇓). Ba/F3 or the Ba/F3-DAP12 transfectants were then infected with retroviruses encoding either Ly-49D, a myc epitope tagged Ly-49H (Ly-49H-myc), or as a control Ly-49A. Neither Ly-49D nor Ly-49H-myc was expressed at appreciable levels on the cell surface when transfected into Ba/F3 cells. In contrast, transfection of Ba/F3-DAP12-Flag cells with either Ly-49D or Ly-49H-myc resulted in high level surface expression of both Ly-49 and DAP12-Flag (Fig. 1⇓), suggesting that Ly-49D and Ly-49H associate with DAP12. We examined whether the charged residues in the transmembrane regions of Ly-49 and DAP12 are important for their association. Ly-49A shares 86% amino acid identity with Ly-49D in its extracellular domain, but lacks the arginine in its transmembrane segment. In contrast to Ly-49D or Ly-49H, when Ly-49A was stably transfected into Ba/F3 or Ba/F3-DAP12-Flag cells, it was expressed at the cell surface alone or in the presence of DAP12-Flag and failed to induce surface expression of DAP12-Flag (Fig. 1⇑). Interactions between Ly-49D or Ly-49H-myc and DAP12 are not species restricted because both Ly-49 molecules were expressed on the surface of Ba/F3-human DAP12-Flag transfectants. However, neither Ly-49D or Ly-49H were expressed on the surface of Ba/F3 cells stably transfected with a mutant human DAP12 molecule in which the negatively charged aspartic acid in the transmembrane was mutated to leucine (not shown). Therefore, both Ly-49D and Ly-49H must associate with DAP12 to effectively reach the cell surface, and their interaction is likely mediated by the oppositely charged residues in the transmembranes of DAP12 and Ly-49. To confirm that Ly-49D and Ly-49H noncovalently associate with DAP12 at the cell surface, Ly-49D/DAP12-Flag or Ly-49H-myc/DAP12-Flag Ba/F3 transfectants were surface iodinated, lysed with digitonin, and immunoprecipitates were analyzed by SDS-PAGE. 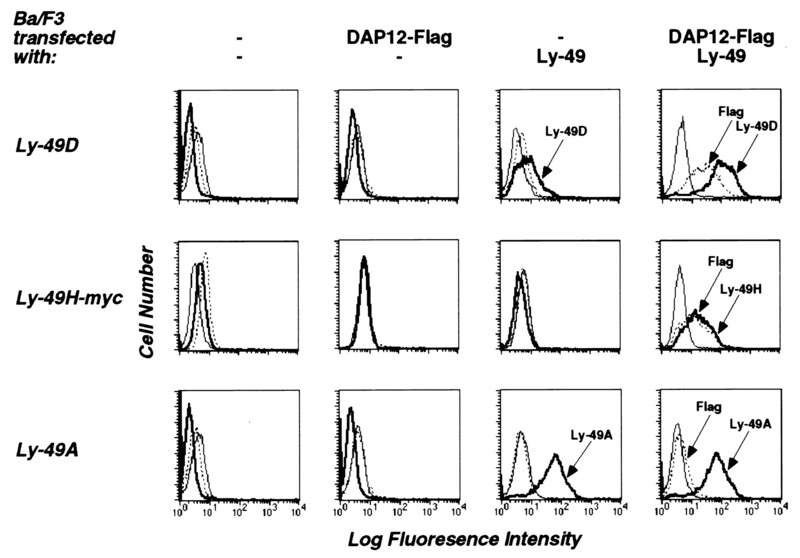 Immunoprecipitation of Ba/F3-Ly-49D/DAP12-Flag lysates with anti-Ly-49D showed two iodinated species with sizes consistent with their identity as Ly-49D and DAP12-Flag (Fig. 2⇓A). An identical pattern was observed with anti-Flag, confirming that the two species are Ly-49D and DAP12-Flag. Immunoprecipitation of Ba/F3-Ly-49H-myc/DAP12-Flag lysates with anti-myc or anti-Flag showed a similar pattern (Fig. 2⇓B). These results demonstrate a physical interaction of Ly-49D or Ly-49H with DAP12 in the plasma membrane. Ly-49D and Ly-49H form noncovalent complexes with DAP12 on the cell surface. Mouse Ba/F3 pre-B cells stably transfected with Ly-49D or Ly-49H (containing a myc epitope on the C terminus) and DAP12 (containing a Flag epitope on the N terminus) were labeled with 125I, lysed in 1% digitonin buffer, and Ags were immunoprecipitated with control Ig (cIg), anti-Ly-49D mAb 4E5 (A), anti-Flag mAb M2 (A, B), or anti-myc mAb 9E10 (B), as indicated. Samples were analyzed by SDS-PAGE under nonreducing or reducing conditions. Since DAP12 possesses an ITAM and engagement of Ly-49D activates NK cells (11), we asked if the Ly-49/DAP12 complexes transmit an activating signal. 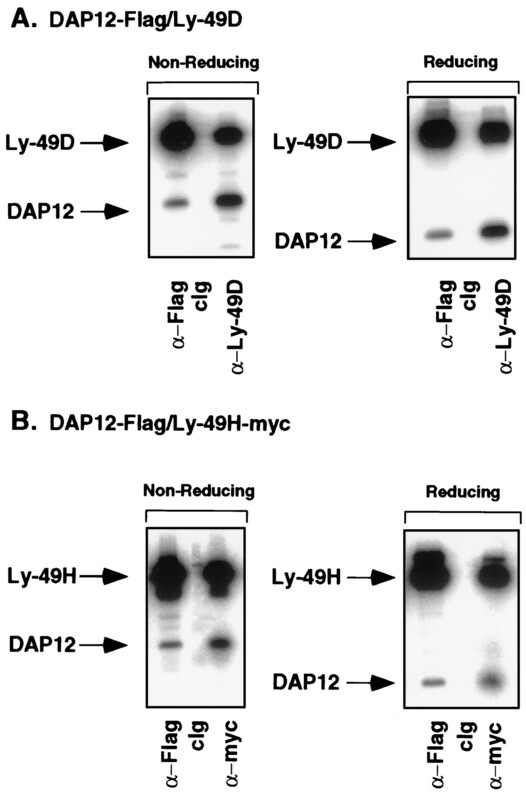 Cross-linking of Ly-49D/DAP12-Flag and Ly-49H-myc/DAP12-Flag transfectants with anti-Ly-49 or anti-Flag resulted in tyrosine phosphorylation of many cellular proteins (Fig. 3⇓C), including DAP12-Flag (Fig. 3⇓A) and Syk (Fig. 3⇓B) in both cell lines. These data provide evidence that Ly-49D/DAP12 and Ly-49H/DAP12 form functional complexes at the cell surface that, upon ligation, can initiate cellular activation. Ly-49D/DAP12-Flag and Ly-49H-myc/DAP12-Flag form activating receptors. Ba/F3 transfectants expressing either Ly-49D/DAP12 or Ly-49H-myc/DAP12-Flag were coated with mAb recognizing Ly-49 (anti-Ly-49D, 4E5, or anti-myc, 9E10), DAP12-Flag (anti-Flag), or control IgG (rat IgG or mIgG1). Cells were washed and the primary mAb cross-linked at 37°C for three minutes. DAP12 (A) or Syk (B) were sequentially immunoprecipitated from the lysates. The immunoprecipitated proteins were blotted and probed with anti-phosphotyrosine mAb (upper panels, A and B), stripped, and reprobed with mAb recognizing DAP12-Flag (A, lower panel) or Syk (B, lower panel). C, To visualize tyrosine phosphorylation of additional cellular proteins upon ligation of Ly-49 or DAP12, total cell lysates were blotted with anti-phosphotyrosine mAb. What are the physiologic ligands for these activating receptors? Ly-49D shares 86% amino acid identity in its extracellular domain with Ly-49A (2), an inhibitory receptor that binds H-2Dd and H-2Dk (22, 23, 24). Ly-49H shares 90% amino acid identity in its extracellular domain with another inhibitory receptor, Ly-49C (3), which interacts with several class I molecules, including H-2Kb (22). Thus, these activating forms of Ly-49 may interact with MHC class I molecules. Evidence for positive allorecognition by NK cells both in vivo and in vitro exists in the rat (reviewed in 25 . Similarly, mouse NK cells recognize allogeneic bone marrow cells expressing certain class I molecules in a positive fashion and mediate their rejection in vivo (26, 27). We have shown that mouse Ly-49D and Ly-49H associate with DAP12 and form activating receptors, providing a possible explanation for positive allorecognition by NK cells. How can the existence of both activating and inhibitory NK receptors that recognize class I ligands be reconciled? We envision three models. In the first model, engagement of activating receptors would function during development to promote maturation of immature NK cells. However, so far there is no evidence for the appearance of activating receptors before inhibitory receptors during development. A second model proposes that an NK cell possesses activating and inhibitory receptor for the same class I ligand. Upon engaging class I, the activating receptor would recruit a protein tyrosine kinase that phosphorylates the ITIM of the inhibitory receptor, resulting in NK cell inactivation. While most human NK cell clones possess at least one activating and one inhibitory receptor, they do not necessarily possess a pair capable of recognizing the same ligand (28). Finally, a third model predicts that NK cells express inhibitory and activating receptors for different class I alleles. In this model, engagement of the inhibitory receptor dominates if ligands for both receptors are engaged. If the ligand for the inhibitory receptor is down-regulated or lost, the activating receptor could trigger lysis of the “abnormal” cell if its ligand is present. This model has the advantage that multiple inhibitory and activating receptors could be expressed by the same cell, a prediction more in line with the findings in NK clones (28). Yet, in the case of loss of all MHC class I molecules by a target cell, other activating mechanisms would have to initiate lysis by the NK cell. We thank Brian Corliss for making the Ba/F3 transfectant expressing the human DAP12 and its mutant, Jim Cupp, Eleni Callas, Dixie Polakoff, and Melinda Cook for cell sorting, Debbie Liggett for synthesis of oligonucleotides, and Dan Gorman for sequencing. ↵1 DNAX is supported by Schering Plough Corporation. ↵3 Abbreviations used in this paper: ITIM, immunoreceptor tyrosine-based inhibitory motif; KIR, killer cell inhibitory receptor; ITAM, immunoreceptor tyrosine-based activation motif; HRP, horseradish peroxidase.